Chicken Blog: Broody, Moody, Lazy Booty? So. Naturally, after we brought home Puff, Trudy, Zelda, Zoe, Temple, and Tesla, motherly Betty went straight to her nest box. She has been there five days. And no, she does not know about the new coopmates... they have not met. But maybe a little bird told her about the cute little fluff balls. Could she be doubting our affections, and feeling abandoned? 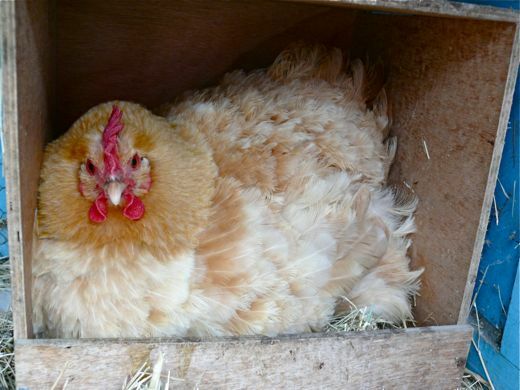 Could she simply be broody? Is she on strike? Let the new chicas eat all the bugs and entertain you, she might be thinking. We love you Betty. Do not be a moody brooder. Should we introduce the chicas, in the hope that she thinks she "did it!" ? Should we leave her alone and let her hormones adjust themselves in their own good time? Does she need chocolate, a spa day?! My hen, Buffy, is broody right now. She has been for about two weeks. I am hoping she remains so for a couple more days, the local chicken supply store is getting some Buff Orpington chicks in a day or two. I plan on slipping two under her. We did that with Betsy last year and she raised Buffy up without a hitch. Good luck! I'm memorizing your title and am dying to use it in conversation at the soonest possible moment! giggle. She is so cute in her box. She looks so earnest. Well, whatever her broody mood, she's certainly photogenic. Has she considered a career in modeling? I don't know....that last photo, she looks like she perked up at the mention of chocolate and a spa day. "You're a pretty bird, Betty. You deserve a trip to the spa! Bring a girlfriend or two, have your toe nails painted, get facials, and eat lots of chocolate....At the very least, for goodness sake, eat chocolate. It fixes most anything." Congrats on your Blogs of Note. Cute wee blog you have here. 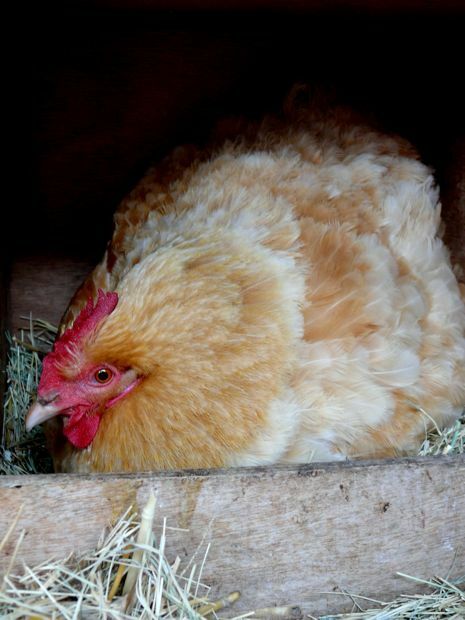 I've had only one serious broody hen and that was Daisy, one of my Buff Orps, last summer. I thought the poor girl was just gonna fade away into a pile of fluff. 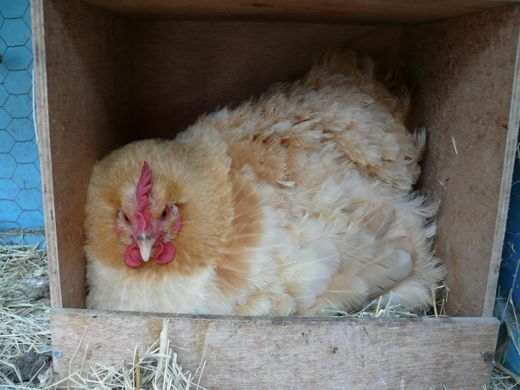 My RIRs get kind of broody-ish by screeching every time I approach the nest boxes when they're sitting, but as soon as I remove the eggs, they're outta there! All my hens are now 2 years old, so I'm going to have to start adding some new ones before long. Their egg production is probably half what it was last year.